Eliza was born in Arlesford, Essex, England 11/10/1827 and died at Rocky River, N.S.W. 7/2/1879. She married Richard Watson on 4/11/1844. Ellen Eliza Watson b. 24/5/1846, Newcastle, N.S.W. – d. “Woodville” Uralla, N.S.W. David Goodwin Watson b. 10/2/1849 Newcastle, N.S.W. – d. 21/6/1926 Summerhill, Ashfield, N.S.W. Samuel J. Watson b. 15/3/1854 Newcastle, N.S.W. - d 22/1/1912 Hillgrove, N.S.W. 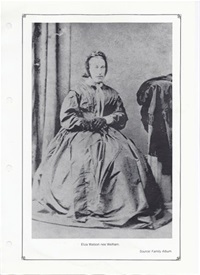 Sarah Ann Watson b 7/5/1856 Newcastle, N.S.W. – d. 18/2/1866 Rocky River, N.S.W. 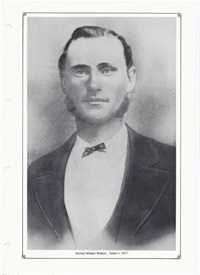 William Watson b. 8/9/1858 Rocky River, N.S.W. – d. 7/8/1931 Emmaville, N.S.W. Mary Ann Lily Watson b. 21/10/1860 Rocky River, N.S.W. – d. Charlestown, N.S.W. James Welham Watson b. 12/3/1863 Rocky River, N.S.W. – d 1927 Wickham, N.S.W. Eliza Goodwin Watson b. 28/4/1865 Rocky River, N.S.W. – d. 17/10/1902 Uralla, N.S.W. Sarah Ann Watson b. 25/9/1870 Armidale, N.S.W. – d. Charlestown, N.S.W. Would you have any information or photos on my GG grandmother Sarah Watson b.1870? Sorry, no photograph. I suggest you contact descendants of Eliza & Richard Watson who have their emails on this page or on my guestbook. Any information and/or photographs would be very welcome as the only information I have is on this website. Thank you Jenny I believe this photo is Richard Watson c 1827 my GG Grandfather. My Great grandfather was Samuel J Watson.However have had this questioned. Thanks Judith for getting in touch. All photos received are from Samuel Welham's descendants and I take their ID at face value. I welcome any corrections to ID. I have these same photos that were passed onto me by my cousin Tom Mace. Are you certain that this photo is of Richard Watson b. 1827?